Trøndelag Centre for Contemporary Art. Working with exhibition programs, production, applications and events. Co-curated and installed the jubilee exhibition BODØ:KUNST 1816-2016 on the occassion of the 200th anniversay of Bodø city and the 70th anniversary of their local art society with Anne Kristin Myrseth. Se kunst i Nord-Norge magazine, in addition to continuous jobs for KUNSTforum and ArtSceneTrondheim. Wrote project proposals for two established Norwegian artists. Since September 2015 I'm a Simply Superior agent by invitation, working with investigation and research, booking and execution of arrangements for Simply Superior events and activities. #Reference. Organised the last Origami Boe concert at Trondheim Art Museum. Organised the "´´´´´´´" (seven single quotation-marks) workshop and performance with Andrew M. McKenzie of The Hafler Trio at Deichmanske Public Library, Oslo. Organised the Norwegian premiere of Giving a Baby a Chainsaw - An Art Apart: The Hafler Trio at Deichmanske Public Library, Oslo with a Q&A session with documentary subject Andrew M. McKenzie. Organised the 8 Gates (& 9 Worlds) performance and artist talk with Orryelle Defenestrate-Bascule at Bakke Gård, Trondheim. Project advisor, lecture booking and juror for punktet visningsrom for kunst. #Reference (Norwegian). I started writing for Norwegian art journal KUNSTforum, and remain a regular contributor. Concert producer and member of the advisory circle: Meta.Morf Biennale for Art & Technology. Curated and produced the Here To Go event. Organised and produced the Yantra Tantra event by Z'EV at Trøndelag Teater. Curated and produced a series of in-house events (concerts, readings, talks) for Rozemin Keshvani's archival exhibition Art, Anarchy & Apostasy at Trondheim Art Museum. Curated and produced the "Hemmelige rom" (secret rooms) exhibition and concert series as part of the larger Trondheim Undergrunn exhibition at Rockheim national museum of popular music. #Review (Norwegian). I worked with Médecins Sans Frontières (Doctors Without Borders) on their F2F project in the MSF Fundraising Department. I had line-manager and HR responsibilities, including recruiting and training, admin.tasks (finance, reporting), and planning and prep. for all activities in the Trøndelag region. #Reference. I have worked in several stores and with online processing in the Ark bookstore chain. My tasks included customer service, sales, assistant management, and purchasing management of classical, art and non-fiction literature. I still work for them occasionally. I worked with artist Anne Kristin Myrseth documenting pre-school children in interaction with contemporary art exhibitions and during creative projects and collaborations on their own, as research for her Master thesis in Humanities and the Arts. Meta.Morf Biennale for Art & Technology. Curated and produced the 15th Anniversary Festival for Klubb Kanin at Blæst Scene. #Review (Norwegian). I worked with Unique Cinema Systems on the digital cinema rollout in Norway, working mainly with Sony and Christie Digital Systems, Barco and NEC projectors, sound systems (incl. Dolby Atmos), networks, automation, theater management systems, and screen installations. Since 2011 I have been writing art critiques and conducting interviews for ArtSceneTrondheim. I have produced 21 texts. Organised and produced Carl Abrahamsson's Döden i våra hjärtan exhibition at Babel Art Space. Organised and produced Origami Boe's Z of 7 exhibition at Galleri Blunk. Organised the premiere screening of Back To Human Nature with an introduction by curator Carl Abrahamsson at Cinemateket, Trondheim. Organised Carl Abrahamsson's lecture Contemporary Timelessness – Eternal Trends at Trondheim Art Academy. Worked as an assistant with various assignments at the Meta.Morf Biennale for Art & Technology. I worked with TEKS - Trondheim Electronic Arts Centre and CIANT - International Centre for Art and New Technologies on the collaborative project NTSD - New Technologies for Sustainable Development as a project coordinator. My job was to coordinate the project and develop a report on behalf of TEKS, and to produce presentations for our collaborators. NTSD took me to CIANT workshops and meetings in Prague, TransISTor in Telč (a CIANT project in cooperation with FAMU, supported by the MEDIA Training Programme of the European Union), Ars Electronica in Linz, Hanoi University of Science and Technology and RMIT University in Ho Chi Minh City for presentations and workshops, and back to Trondheim and the Meta.Morf Biennale. 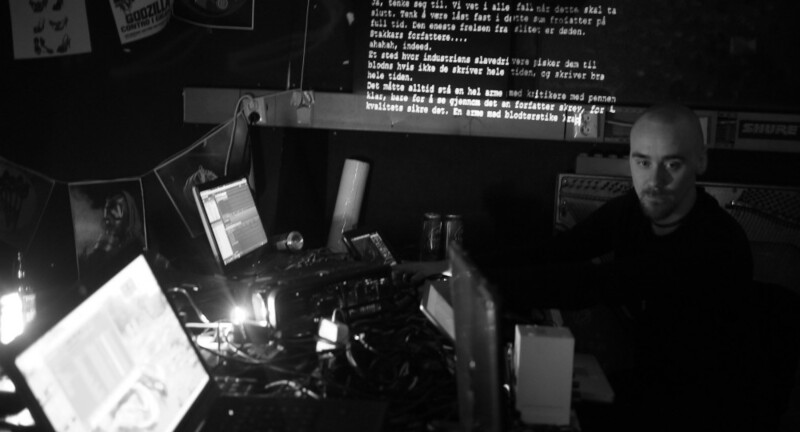 I am a certified cinema projectionist and worked with several digital and analogue cinema systems in Trondheim Kino and the Kosmorama Film Festival. I also worked as a shift leader, and was responsible for the cinema membership program Kinosonen. From 2008-2011 I was elected union representative and thus employee representative on the board. Trondheim Kino was testing several digital cinema solutions at an early stage, which later led me to work with Unique Cinema Systems and the digital rollout program. I worked for the independent bookstore Øksendal in Trondheim (now closed). My tasks included customer service and sale. I served my mandatory military service in the Armoured Battalion (Panserbataljonen) at Setermoen Garnison, where I trained in an armed security team and later served as assistant commander (ko-as) in the armoured mortar group of Combat Support Squadron 6. I've worked at a chocolate factory, a dairy/cheese factory, a bakery, a youth club, and on various building sites. An annual DIY festival, art project and social experiment dedicated to relational aesthetics, community and experimental music, founded in 2006. Read more about Støy på landet at the concept and project page. Klubb Kanin is an open stage project founded by Tore Honoré Bøe et.al. in 1997 as a part of the Origami Republika network. I have organised a number of events in the series since 2010. In 2014 I was invited to produce a Klubb Kanin exhibition at the national museum of popular music. Read more about Klubb Kanin at the project page. A 'pub moot' based around public lectures on fringe subjects, outsider philosophies and esoteric topics. I have produced 50 events under this banner. I am the founder of the project and do all booking, logistics and promotion in cooperation with a small advisory circle. In 2012, I expanded Forum Nidrosiae to include the Here To Go series. Read more about Forum Nidrosiae at the project page. Since 2007 I have made several recordings and performed at various gallery spaces and underground venues in Norway and abroad. In 2011, Arnfinn Killingtveit, Thomas Holme and I performed a live soundtrack to artists Karen Nikgol and Lisa Lie's theater piece "Sara Astro and Orphenix West" at Podium in Oslo. Arnfinn and I returned to work with Nikgol on his play "The Silent Song of the Sphinx" at Black Box Theater the next year. I have also provided sound work for various exhibitions by Anne Kristin Myrseth and in direct collaborations with her. In 2012 I performed a 24 hour concert with Killingtveit, and have done several prolonged concerts since then, including the most recent "7 hrs sleep" performance at MultiNO! in December 2014. In 2015 we were invited to open the Spaces Speaks series curated by artists Joakim Blattmann and Ricardo del Pozo at RAM Galleri in Oslo, sponsored by NOTAM - Norwegian Centre for Technology in Music and the Arts. Read more about my music and performances in the music section. Wrote a thesis on the validity of the institutional theories of Dickie, Danto and Thierry de Duve.